Good morning, I would like to verify if I'm doing these problems correctly (#'s 1-6). Also, is it even possible to solve #7 (red problem) if I don't have a mass number to use? a You can calculate 7 if you take for example one 1 mole of the iron chloride hexa hydrate. b I think its the decomposition to ironoxide and hydrochloric gas. 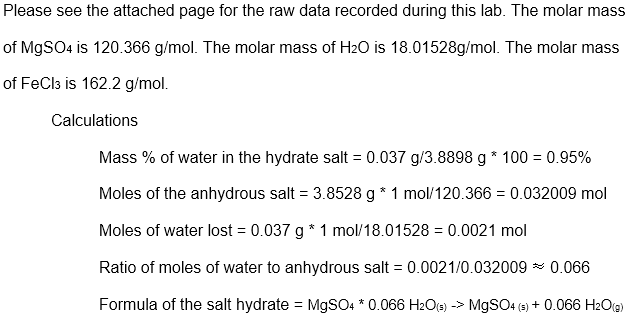 The formula for Magnesium sulfate is strange. Normaly it has 7 water.